In the eighteenth century Italy was the centre of the art world. Young artists flocked to Rome, Venice and Florence and were dazzled by the achievements of past generations. It was widely believed that the great artists of the Renaissance knew a ‘secret’ that had been lost. How did Titian achieve his “divine” colours? 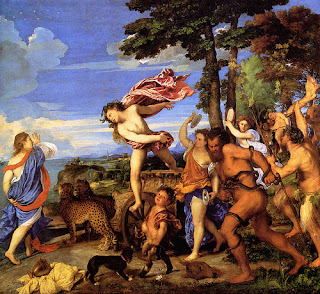 Nobody knew but many artists became obsessed with the idea that if they could only discover this secret, which Titian supposedly got from the Greeks, they would outshine their rivals. Paintings by Giorgione and Titian like the one illustrated above, Titian’s Bacchus and Ariadne (1523), had a luminosity and richness of colour that eluded living artists who continued to search for the ‘secret’, rather like medieval alchemists pursuing the formula for gold. Benjamin West , seen here as a young man, was an American who claimed to have been instructed in the preparation of pigments by native Indians. 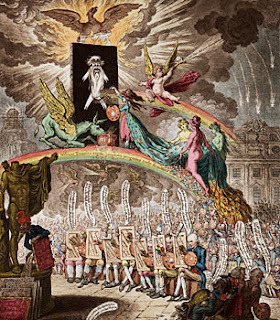 After his Death of General Wolfe caused a sensation in 1770 he was appointed Historical Painter to King George 111 and later succeeded Reynolds as President of the Royal Academy. Ever since his trip to Venice when he was young West had longed to discover the ‘secret’ of Titian’s magnificent paintings. Thirty years later, this made him vulnerable to a hoax. Ann Jemima Provis was a young miniaturist whose work was exhibited at theRoyal Academy and her father, Thomas Provis, was a "sweeper of the court" at the Chapel Royal at St. James's Palace. The Provises approached West and told him they had found an ancient Italian manuscript which revealed the Venetian Secret. The original manuscript, they told West, had been destroyed in a fire but fortunately Provis had cannily made a copy. Initially the ‘secret’ was only to be divulged to seven artists and West and six other painters gladly paid 10 guineas each to be initiated. Provis then became even more greedy and suggested that all the artists who were interested in sharing his secret manuscript should form a syndicate of 53 artists. Each member would contribute 10 guineas, which would have earned Provis a total of more than 600 guineas, then a fabulous sum. In addition to allowing paid up members of the syndicate to read the manuscript, Ann Jemima offered to give the artists lessons demonstrating the Venetian technique which, she said, included the application of a dark red ground, or foundation layer, to the canvas. She also taught them to use thin linseed oil as a medium to bind the paint’s pigments. It was also essential, she said, to use the “Titian shade,” a mix of ivory black and Prussian blue that was used under glazes of bright colors. Prussian blue was actually invented more than 100 years after Titian’s death. In his own paintings, Titian used lapis lazuli . Titianus Redivivus; or the Seven Wise Men Consulting the Venetian Oracle – a Scene in the Academic Grove. Seated in a row are some of the artists in the syndicate, including Farington, Westall, Stothard, Smirke, Opie, and Hoppner. Other artists, whose names appear on the far left, had not been taken in by the scam. These include Bartolozzi, Fuseli, and the 22-year-old Turner, whose own later experiments with colour still astonish us. Ann Jemima Provis appears on a rainbow, painting a “portrait” of Titian, her train supported by the Graces. On the far right, in the foreground, Benjamin West sneaks away. The ghost of Sir Joshua Reynolds rises up from the stone floor. In the background, the brand new Somerset House façade of the Royal Academy is cracking, presumably as a result of the scandal. There is no record that the Provises were ever prosecuted. Seven years later West painted an almost identical version of Cicero Discovering the Tomb of Archimedes, using more traditional techniques. The colours in this painting have survived and it is now in the collection of the Yale University Art Gallery. West’s career recovered from this embarrassing scandal and he produced many more distinguished paintings. When he died in 1820 he was buried in St Pauls Cathedral. A fascinating story. Thank you.